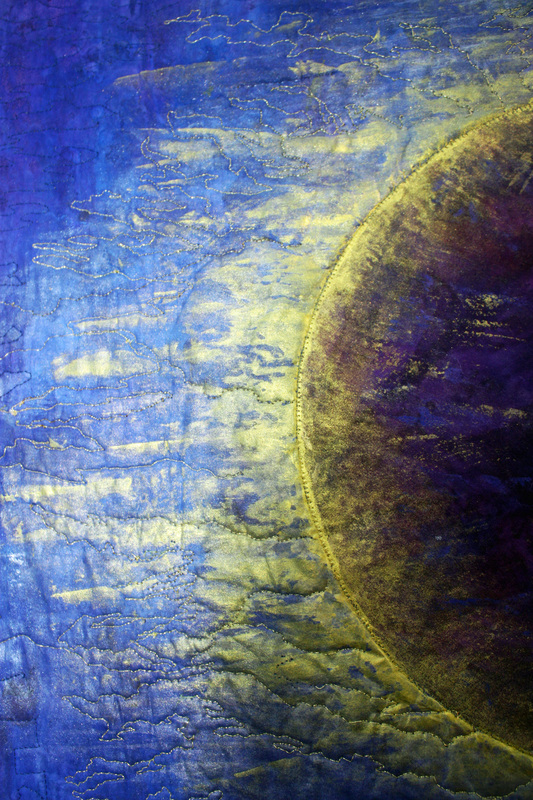 This in my latest art quilt “Lunar Eclipse“, it’s going up on Etsy in a couple of minutes. I thought an eclipse would be a cool idea. I chose lunar, the silk I had already painted was dark blue and purple. To create my eclipse, I played around with metallic paints and other colored paints to add shading. I was having a great old time on this one, later, I experimented with a crystal glue gun adding crystals to mimic lights.Fun. After I had finished appliqueing the moon on and had thread painted the metallic rays, what next? There was rather a lot of empty space under the eclipse to be filled.What sort of elements would enhance the eclipse scene?That was a challenge, it had a rather off the beaten path sort of subject matter, thinking, thinking & making mental pictures, well?How about a city skyline? I like it, yes that’s it! Keep it simple, not too busy, a stylized cityscape. I wanted the eclipsed moon to be the real focus of this piece. The next choice was quilting design. On many art quilts I need to roll that around in my head several days. Consider the context, this was a bit harder, the subject was a little off the beaten path. Obviously the quilting done on a landscape quilt is different than one chosen for a traditional quilt. Were we speaking of art quilting? you may ask? Well of course we were. For a visual treat, have a look at the art quilting section that Karen McTavish included in her book, “Quilting For Show”. A wonderful book. There are several which left me with my jaw on floor.Two particularly impressed me by Hollis Chatelai’s, utterly exquisite.Their titles are “Blue Men” and “The Grandfather”. You will enjoy this book, loaded with great info and of course Karen’s beautiful heirloom quilting. If you love quilting & in particular art quilting you will be treated to the work of some of the best of the best, Diane Gaudynski, Sharen Schamber, Caryl Bryer Fallert, Ricky Tims and so many more I couldn’t possibly name them all. Well, back to my subject, here is my finished quilt,”Lunar Eclipse”. Well, that’s it, the finished quilt. Thank you so much, I appreciate it even more coming from you a very clever talented person! Thanks Diannajessie. With art quilting I have found the place where I really can have the best of quilting and art, both loves. With silk painting as a base, then building on that with thread paInting to add depth & detail really allows me tto do what I love too, the free motion.& quilting.